Welcome to our small family camp - in a completely new and different kind of vacation. The Family Camp AS enables you to wake up surrounded by nature and the calming wave of sea waves. 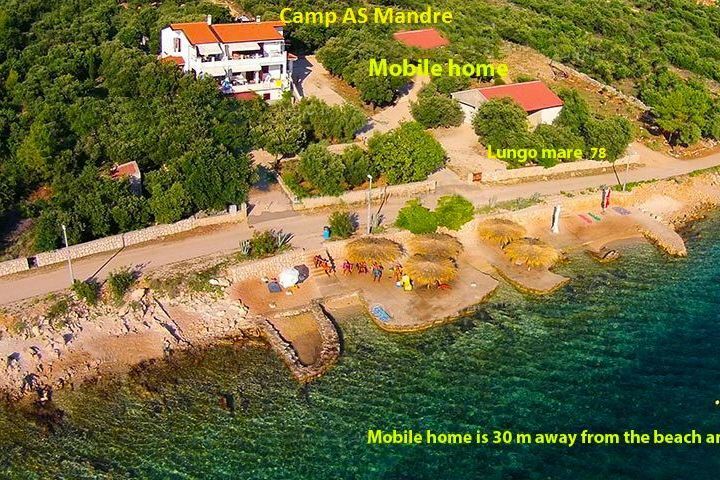 In the camp we have 4 parcel for tents and 1 parcel on which a mobile home is located. The mobile home is located in a very attractive place - 1st row to the sea, in haystack woods only 30 meters from the beach. The fully equipped and air-conditioned mobile home has a surface of 24 m2, two separate bedrooms, a bathroom, a living room and an kitchen. The large covered terrace also has an outdoor kitchen (with a small grill). WIFI is free for camp guests. In use, you have 2 large garden deck chairs located on the terrace of the mobile house, as well as an outdoor solar shower. From the appliances in the kitchen are: fridge (one shelves for freezer), stove, electric kettle, filter coffee maker, SAT TV, air conditioning. You are provided with bed linen, towels, parking space. Distance from the center of Mandri is 800m. Mandre are a small tourist resort located on the south side island of Pag with a beautiful view of islands Silba and Olib and the little islands Maun and Skrda . All along Mandre there are beaches with clear blue sea. The location is perfect for those who want to peaceful vacation in magnificent natural surroundings.